The eagerly anticipated announcement that Game of Thrones fans have been awaiting has been made. The United States Ambassador to Spain, James Costos, has confirmed that Series 5 of the popular TV series will be filmed in Andalucía, Spain. The Royal Alcázars in Seville (Reales Alcázares de Sevilla), which is the oldest Royal palace in Europe, has been chosen as the main venue for the filming of Series 5 of the Game of Thrones. 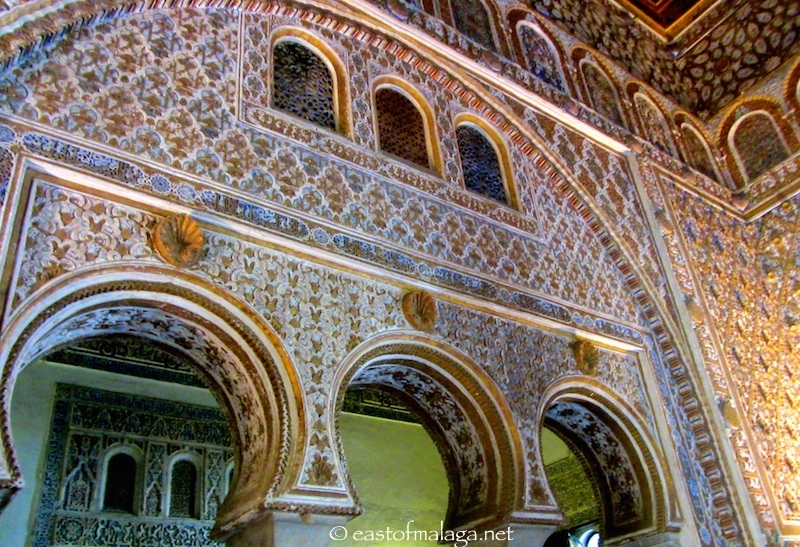 The Alcázar, originally a Moorish fortress, was declared a UNESCO World Heritage Site in 1987, and the palace is one of the best remaining examples of mudéjar architecture. (Filming will take place from 14th – 22nd October 2014). 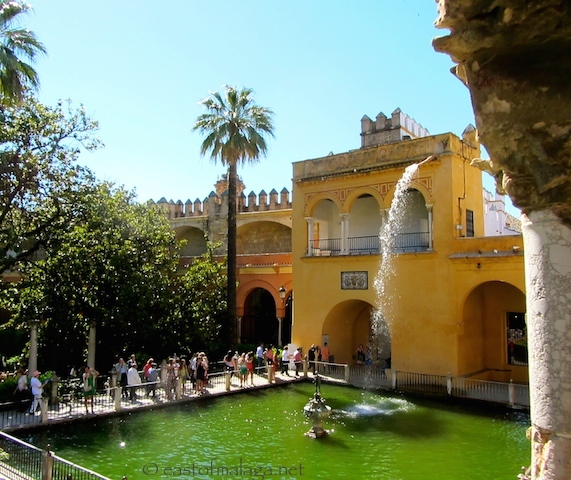 Mercury’s Pool in the Alcazar gardens, Seville. 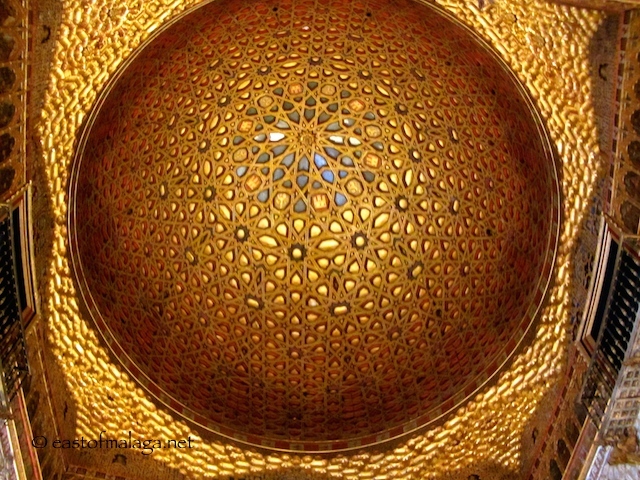 Gold ceiling of the Ambassador’s Hall, inside the Alcazar of Seville. It has also been confirmed that filming will take place within the historic town of Osuna, in Seville province – the origins of which date back three thousand years. Whilst the exact locations of all filming within Andalucía for the Water Gardens of Dorne is still being kept secret, it’s understood that the Alcázar of Córdoba, the Alhambra Palace in Granada and the Alcázar of Málaga have yet to be completely ruled out. This is good news for Andalucía with a boost to the economy in the region of €80 million euros, creating around 900 permanent and 5000 temporary jobs, as well as a growth in tourism to the area. At this stage, specific characteristics for actors have not been announced – but hey – GO FOR IT! Which location would be your choice? Would you like to be an extra in Game of Thrones? This entry was tagged Andalucía, Cordoba, Europe, gardens, Granada, lifestyle, Malaga, Seville, Spain, travel. Bookmark the permalink. The first season was filmed in Malta and l know there were problems due to environmental damage. The production left in a hurry from what l gather, let’s hope it works out in Andalucia. OH my goodness – I hope that doesn’t happen. These buildings are much too precious. Personally I think it’s a double-edged sword. On the one hand it’s a much needed boost to the economy but there is always the potential dangers involved, too. Yes, let’s hope it doesn’t all end in tears. I was hoping they’d film in Almeria so I could be an extra! Ah well, twas not meant to be! Fabulous series though. Can’t wait for the next season! Thanks for your comment – and hard luck Almeria about the filming. Yeah. I could be the new Calamity Jane! Actually I’ve just added to the post that the Spanish director has issued a casting call – so if you want to apply ……? Email supplied. Wow more of your beautiful country . I have to remember to watch !!! The basic plot is confusing to me as I only watch sporadically but the cinematography and costuming are just great! I understand that the filming causes a bit of a nuisance in Dubrovnik! I’d be very cross though if I turned up to see the Alcazar of Seville and was told that it was closed for filming! Me too – and I’m much closer than you! I know only the Alhambra, the water gardens are beautiful, so a lovely setting. I must go to Seville and Cordoba as I have seen that they also are spectacular. Awesome! So looking forward to it! The Alhambra would be my pick.